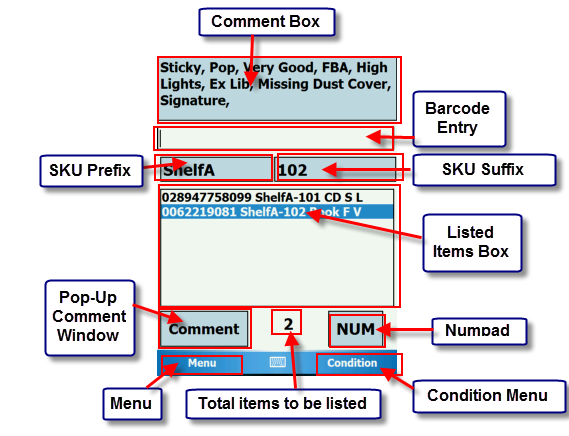 Comment Box: This shows what comments are currently applied for a selected item, as well as the fulfillment channel, condition, and any special commands that have been enabled. Barcode Entry Bar: This is where you scan item’s barcodes, customized comment or command barcodes. SKU Prefix: Usually serves as a location for an item (i.e. Shelf A, Box 1). To modify the prefix, tap this box. SKU Suffix: A number that increases for each item scanned. To modify the suffix, tap this box. With a SKU Prefix and Suffix, you can find a sold item easily. UPC/ISBN, SKU Prefix-SKU Suffix, Category, Fulfillment Method, Condition. For Fulfillment methods, ‘S’ = Self-Fulfill, and ‘F’ = FBA. For Conditions, ‘N’ = New, ‘L’ = Like New, ‘V’ = Very Good, ‘G’ = Good, and ‘A’ = Acceptable. Comment Pop-Up Button: Allows you to choose from a list of comments for the currently selected item. Total items to be listed: The number of items to be listed in the current batch. Numpad Button: Tapping this button will bring up a numpad for manual entries of ISBNs or UPCs if an item does not have a barcode to scan. Menu: This will bring up the command Menu, which allows you to toggle various special commands, as well as close the program. Condition Menu: Allows you to select the condition for an item.